Those ready for a break from the blast of winter weather this past week won't see any relief over the weekend. Forecasts predict yet another round of snow headed to the D.C. area. To make matters worse, the National Weather Service has issued both a Winter Storm Warning and a Winter Weather Advisory for parts of the region Saturday and Sunday. WASHINGTON — Those ready for a break from the blast of winter weather this past week won’t see any relief over the weekend. 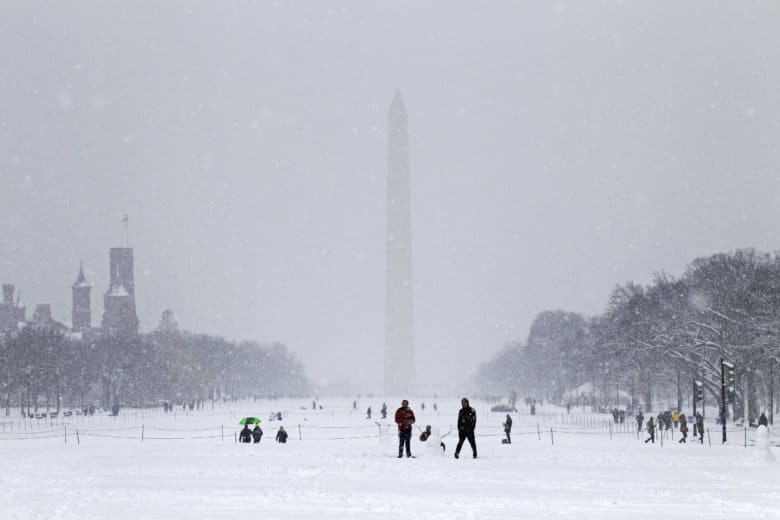 Forecasts predicted yet another round of snow headed to the D.C. area. The National Weather Service has issued a Winter Storm Warning for Baltimore, Carroll, Frederick and Washington counties in Maryland from 10 a.m. Saturday to 6 a.m. Sunday, with significant ice, snow and some sleet expected. 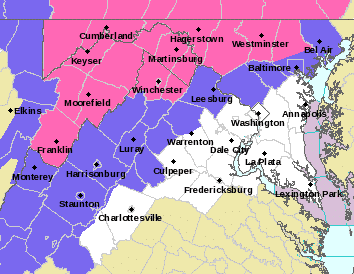 A Winter Weather Advisory has been issued for Fauquier and Loudoun counties in Virginia, and Montgomery and Howard counties in Maryland starting 10 a.m. Saturday. Draper said for those under the Winter Storm Warning, she was most concerned for a period of freezing rain during the day Saturday. “Temperatures in the warning (area) will be right around freezing, and with warmer air aloft, we could see some ice develop as precipitation falls,” she said. She added that snow was possible, but only around 2 inches or less. “If you can avoid travel tomorrow around I-81 and the Mason-Dixon Line, that is your best bet. In the D.C. metro area and east, roads should be just wet, not slick,” Draper said. The temperatures Saturday are expected to be in the upper 30s to low 40s. Rain is expected to continue Sunday, turning into snow in the early with rapidly falling temperatures. The temperatures are expected to be in the low 40s in the morning, falling to below freezing by the afternoon to in the 20s and below in the evening. “Temperatures will fall below freezing Sunday afternoon, leading to icy spots on our roadways,” Storm Team 4 meteorologist Mike Stinneford said. Monday is expected to be “blustery and very cold,” said Storm Team 4 meteorologist Matt Ritter. The highs are in the 20s for Monday with wind chills below zero for much of the day. SATURDAY: Rain, wintry mix in spots, moves in 10 a.m. to 3 p.m. Becoming all rain overnight with some minor flooding possible. Watch for ice and snow concerns well north and west of the District. SUNDAY: Rain/mix ends by morning. Windy and turning colder. Icy spots possible overnight. MONDAY/Martin Luther King Jr. Day: Dangerously cold. Mostly sunny and windy. TUESDAY: Partly sunny and not as cold.